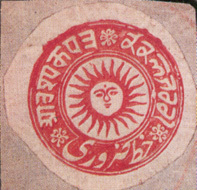 The “Dak Zaruri” or “Urgent Post” stamp, is probably the earliest express delivery label ever issued. Nothing is known of the true date of its production, and but little of its history. The die was not included among the postage-stamp Dies and Plates surrendered for defacement in 1898. Masson held that it was the oldest “Service” or Official stamp of any Native Indian State. The “Philatelic Journal of India” contains more than one further allusion to other copies, and also an assertion that used specimens were known, but proof of this is lacking. Masson wrote in his Handbook (Part I., p. 36) that letters carrying the “stamps” were passed, day and night, accompanied by a “time-bill” from one runner to another, and that it was only so “used” on the Maharaja’s, or on State Service. If, as we think probable, this is what occurred, it would seem most unlikely that such correspondence would ever pass through a Post-Office (where, alone, the impression could be postally cancelled); and if this is admitted, the existence of “Used Specimens” may be doubted. There is, in short, no reason to believe that cancellation was ever applied, nor that the impressions were ever issued from any Post Office, either to Officials to to the general public. On the other hand there can be no doubt but that they did a certain amount of legitimate, though limited postal duty during the watercolour period (1866-1876), and until further information is forthcoming, it will probably be best to classify them as “Private post-stamps” prepared for, and used by the Maharaja. Private stampWatercolour on Native paper.